The DOMA installation where you were redirected from is of version 3.0.3. The latest version is 3.0.8. Consider upgrading! This page contains information about how to download and install DOMA, a digital orienteering map archive, on your PHP+MySQL-equipped web server. The digital orienteering map archive helps you display your and your friends' orienteering maps and route choices on the web. The first version was released in the end of 2008. As of November 2018 DOMA has been installed at 2 200 web servers, where 7 500 users have added 195 000 maps. The software is developed by Mats Troeng and Michal Besta. 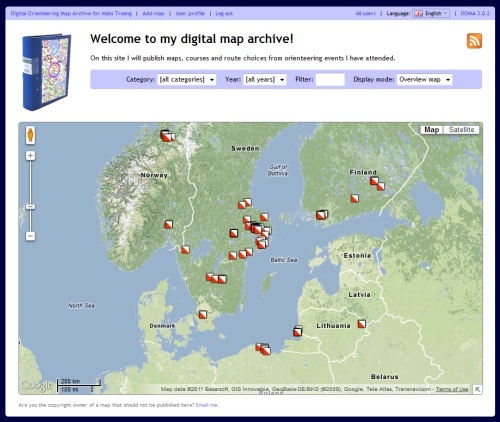 To see it in use, take a look at OK Linné's digital orienteering map archive. Support for multiple users on a single installation. 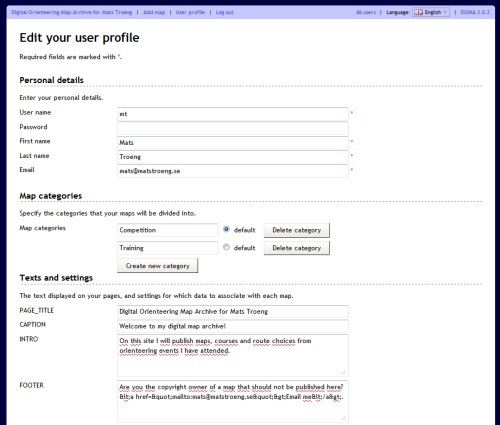 The administrator can add and edit user profiles in a simple interface. Users can create user profiles by themselves by entering a code provided by the administrator. Simple user interface for adding and editing maps and traning/competition information. Maps can be grouped in customizable categories, e. g. competition or training. Page listing all users and the latest added maps. Automatic generation of thumbnail images for the start page. Overview maps showing the geographical locations of the maps (provided they are created in QuickRoute 2.3 or later). KML export, making it possible to open maps in Google Earth (provided they are created in QuickRoute 2.3 or later). Maps can be hidden until a certain time - useful when uploading maps for a training/competition in advance and make them available immediately after the training/competition is completed. Available in Czech, Danish, English, Estonian, French, German, Hungarian, Italian, Norwegian, Polish, Portugese, Russian, Spanish, Swedish and Turkish language versions by default, but all texts are customizable. Customizable web site design using style sheets. You may use and modify this software freely. Web server with PHP 5 or later with the GD library, MySQL 5 or later, and some hundred megabytes of disk space (if you plan to add a lot of maps). If you don't have a web server, I'd like to recommend One.com, www.one.com, that offers affordable web hosting starting from €1.25/month. Write access to the folder where DOMA is installed for the server user account under which PHP runs. The administrator (probably you) installs DOMA on the web server, edits the configuration file and adds and edits users. The users (you and your friends) can add and edit maps using their favorite web browser or QuickRoute. No programming skills are needed. Fixed bug in QuickRoute parser that caused an error when showing some maps in PHP 7. It is possible to install multiple digital orienteering map archives on one single server, as long as each archive's installation folders and database tables are unique. Download the current installation package from the link under the Download header above. The installation package is a zip file containing all the necessary files. Use an FTP client to copy all the files and folders in the zip file to some folder (the root folder or another folder that you create) on the server. This instruction is not applicable when upgrading from a previous version! The config_original.php file contains various settings such as database and language settings. Make a copy of this file, rename the copy to config.php, edit config.php file in a text editor according to the instructions given, and save the changes to the server. IMPORTANT! Use UTF-8 text encoding without byte order mark (BOM) when saving. Note that some text editors (e.g. Notepad) by default add a BOM to the beginning of the file when saving in UTF-8. DOMA will not work if a BOM is present, so make sure to use a proper text editor. The free Notepad++ is an excellent choice. Open your web browser and navigate to http://www.yourdomain.com/yoursubfolder/index.php, where www.yourdomain.com and yoursubfolder are to be replaced with your actual settings. A message telling you that the site was successfully created is hopefully displayed. If there are error messages, make the necessary adjustments and try again. 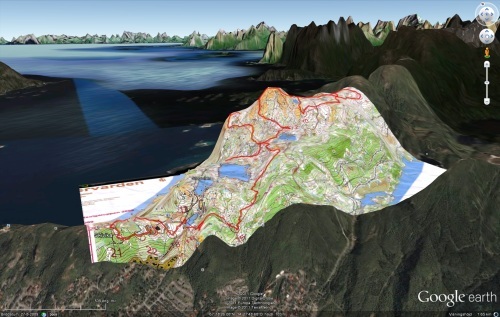 The digital orienteering map archive is now installed, and the start page is http://www.yourdomain.com/yoursubfolder/index.php. You are strongly encouraged to make a backup of all files before upgrading DOMA to a new version. If you are upgrading from DOMA version 3.x to DOMA 3.y, just copy the new files to the web server, overwriting the old ones. If you are upgrading from DOMA version 2.x to DOMA 3.y, please read the upgrading instructions! Compare the config.php file (your current configuration file) with the config_original.php file (the default configuration file for the new version) and add any newly introduced settings in config_original.php to config.php. DOMA will fallback to default behaviour if the newly introduced settings are not added to config.php. Follow the Administrator log in link at the top of the page to log in using the administrator user name and password as entered in the config.php file. You are now able to add and edit users. As a logged-in administrator, create a new user by clicking the Create new user link at the top of the page, and fill out the form. To log in as a user, go to the user start page and click the Log in link at the top of the page. To add a new map, click the Add map link and enter the requested information. To edit or delete an existing map, click the Edit link next to the map. 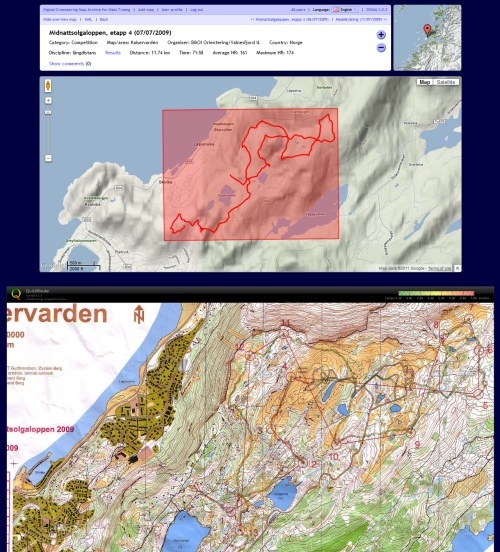 A web service interface makes it possible for other software to upload and edit maps in the digital orienteering map archive. The web service address is http://www.yourdomain.com/yoursubfolder/webservice.php. 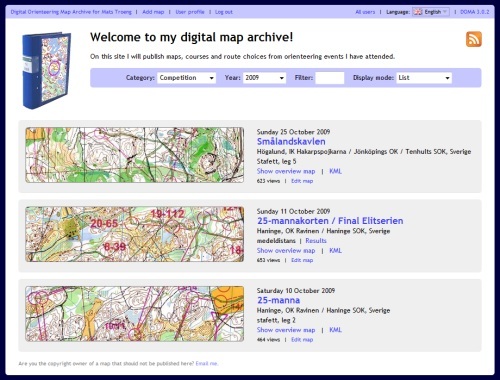 The QuickRoute software, www.matstroeng.se/quickroute, uses this web service to provide integration with your digital orienteering map archive. Version 2.2 or higher of QuickRoute is required. Select Tools > Publish map in the QuickRoute menu, and provide the web service address together with your user name and password. The DOMA project is hosted at GitHub, where also the latest source code can be found. Please drop an email to doma@matstroeng.se if you are interested in contributing to further development. Sorry, but we do not have the time to provide help with issues related to configuration or debugging of DOMA installations. Use the digital orienteering map archive at your own risk.